The summer camping season is in full swing, so celebrate the good times with a refreshing camp cocktail. What’s a camping trip without a few cocktails? 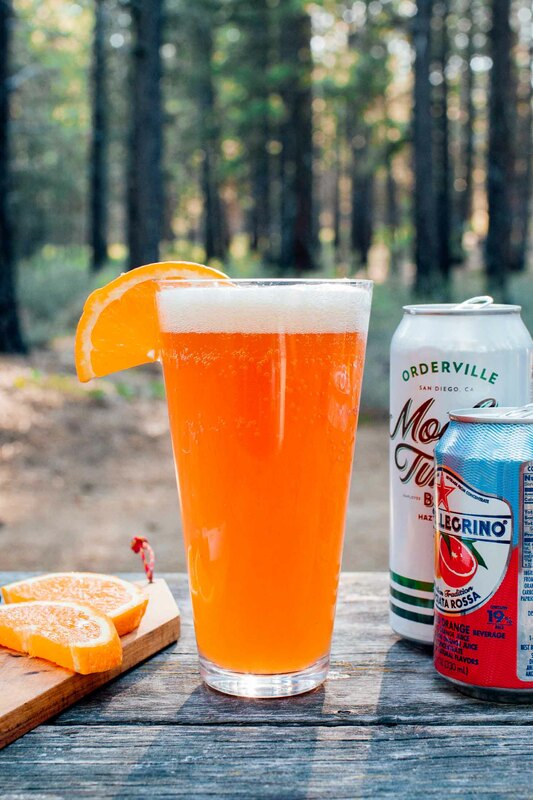 One of our favorite parts of summer camping is the extended and prolonged “happy hour” which starts sometime in the mid-afternoon and continues throughout the evening. Whether we’re unwinding in a hammock or warming our toes by the campfire, a nice cocktail is a great way to slip into that full-body outdoor relaxation. To get all of you into the spirit, we decided to share a few of our favorite summertime drinks. Most of them utilize cans to help reduce the amount of breakable glass that needs to be transported out into the woods. And all of them rely on just a few ingredients. So mix yourself one of these drink and cheers the summer camping weather! Enjoy it while it lasts! The hazy New England-style IPA is the latest trend to take over the craft beer scene. While deliciously juicy beers go down easy, they’re still IPAs at the end of the day. So it only takes a couple to start to feel it. That’s why when we’re day drinking, we’ve become big fans turning them into hazy shandys. Just cut them with a citrusy soda like San Pellegrino. All the same flavors, but half the ABVs. Split a 16 oz IPA between two pint glasses (juicy or hazy New England style IPA’s are perfect for this one!). Top off with your favorite flavor of San Peligrino – we love the blood orange or clementine flavors. Garnish with an orange wedge & enjoy! 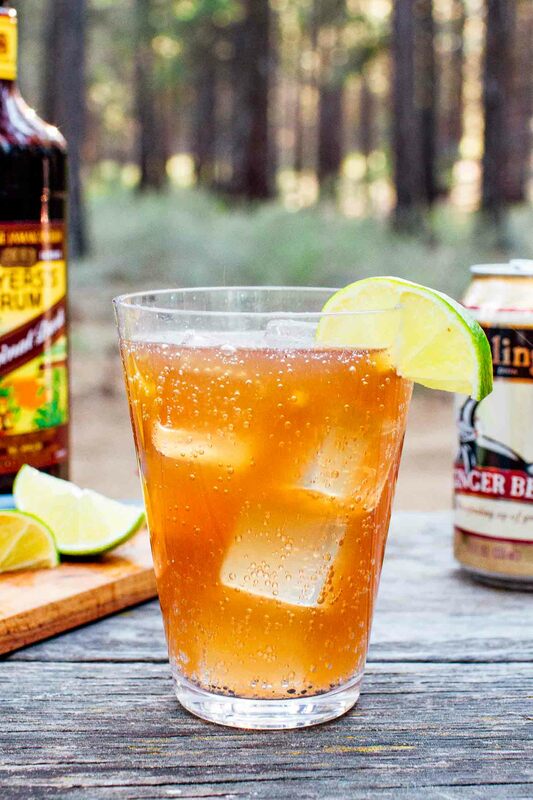 Despite its origins as more of a nautical cocktail, we’ve adopted the Dark & Stormy as one of our go-to summer camping drinks. If ever there was a season for rum, it’s summer! One of the best things about this drink is its simplicity. Equal parts dark rum and ginger beer with a splash of lime juice. Add 1.5 oz dark rum to a rocks glass with ice. Squeeze in the juice of 1/2 lime (or a whole lime if it’s on the drier side). Top off with half a can of ginger beer. Stir, garnish with lime, and enjoy! Bringing some heat to this cocktail lineup, Michelada is a great way to spice up a cold Mexican lager. What’s nice about this drink is you can dial up the heat as much (or as little) as you like. We prefer Tapatio or Cholula hot sauce, but you can use whatever is on hand. A splash of Worcestershire sauce and lime juice, and you’ve got spicy yet refreshing cocktail to keep you company by the campfire. Lightly wet the rim of a pint glass with water and roll in a chile-lime salt mix (Tajin is a classic, or the Trader Joe’s version is a decent substitute). 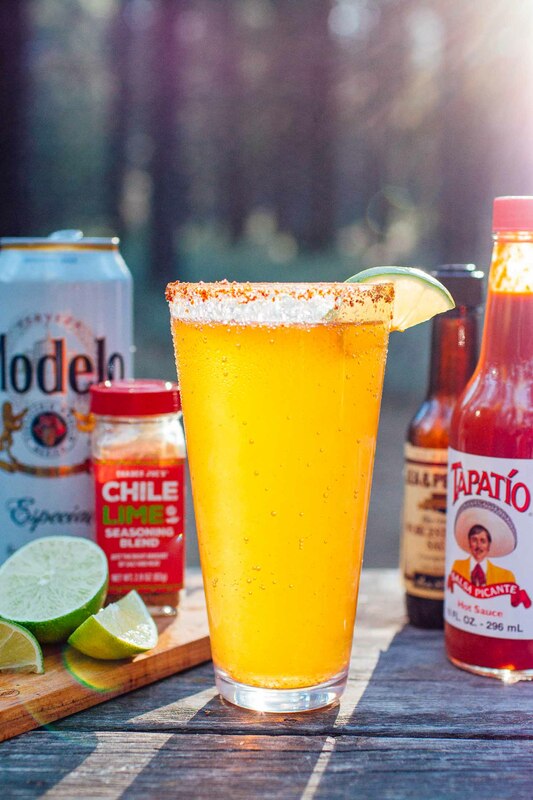 Pour 12 oz of your favorite Mexican lager (Modelo Especial, Tecate, or Pacifico would work) with a few shakes of Tapatio hot sauce, worcestershire sauce, a few big squeezes of lime and a good pinch of salt. NB: There are many versions of the michelada, some including Clamato or tomato juice. If you’re into that (we are a house divided: Megan is, Michael isn’t), feel free to add a few ounces in with the beer!